Our Award winning team of professionals continue to stay on top of the newest technology and designs. We are the innovators in our industry, and hold the highest standards for our products. 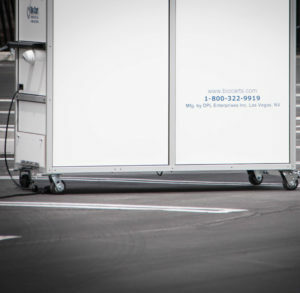 View all the options and features available for the Bio Cart 10 and the Bio Cart 13LT The Best Mobile Containment Cart Available. The expanding and collapsing bellows are operated by the power lift. While the air scrubber is turned on, they maintain negative pressure in the work area at all heights without “billowing” into the cart. 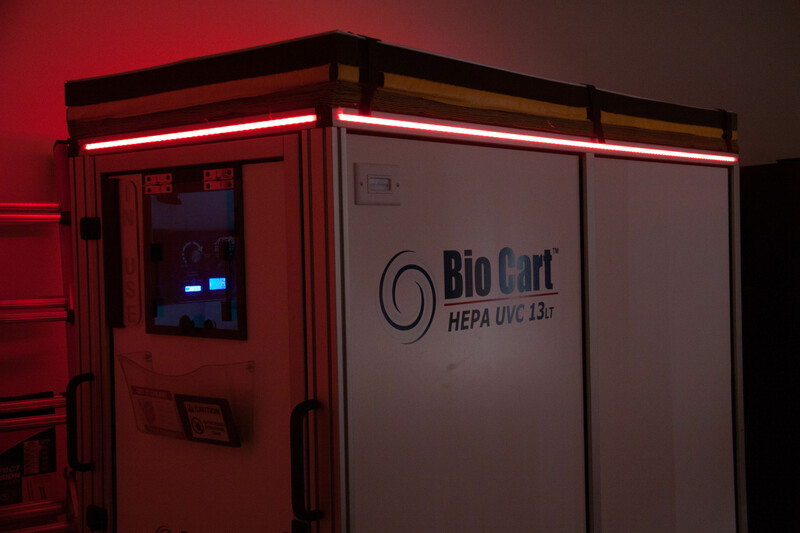 With the ease of transportation, advanced features and options, and affordable pricing, there is no question that the Bio Cart is the best containment cart available on the market today! 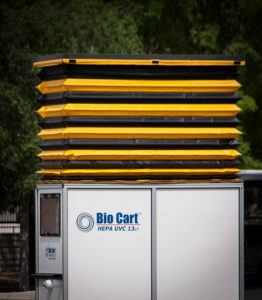 The Bio Cart continues to hold the standard for containment carts in the industry. 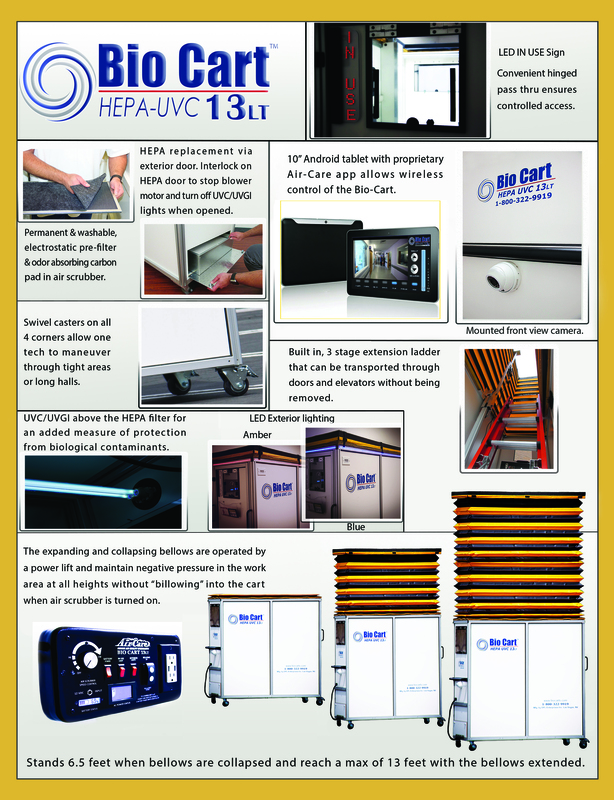 It contains, not only the required features, but the most technically advanced available on any containment cart you can buy today. It is the only tablet based cart available and includes Air-Care’s own proprietary app to operate with a wireless feature. 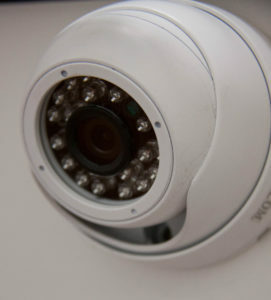 With the Front View Camera, you can move around corners and objects with ease. The LED “IN USE” sign is a feature used to help maintain safety while the cart is in operation. The bellows are 3″ high while collapsed and 90″ while fully extended. They are made with a fire retardant black and yellow vinyl material. The Bio Cart 10 comes equipped with all the functionality and key features needed to complete a job with ease and precision. It Includes a HEPA filter, power lift for operation of bellows, built in 3 stage extension ladder, locking wheels & swivel casters, expanding and collapsing bellows, and a convenient hinged pass-thru window to ensure controlled access. The bellows are 3″ high while collapsed and 60″ while fully extended. They are made with a fire retardant black and yellow vinyl material. 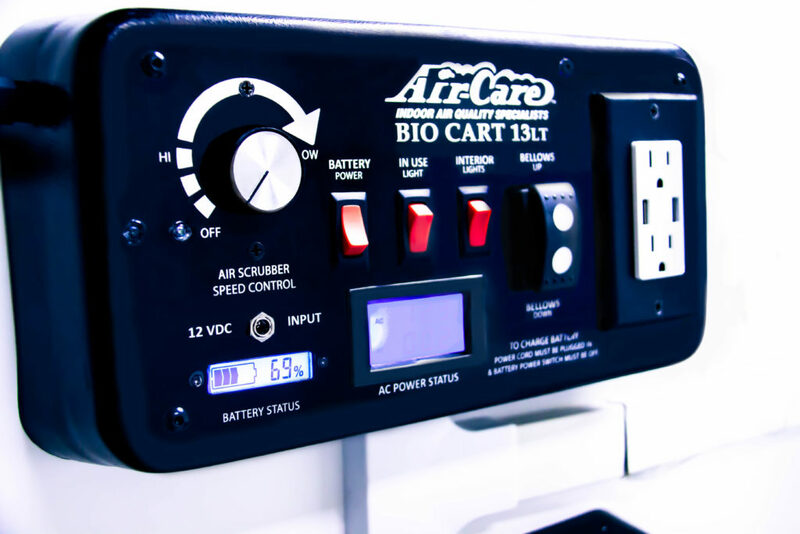 The Bio Cart 13LT by Air-Care features the only dust contamination cart that can be operated and controlled with a wireless tablet. 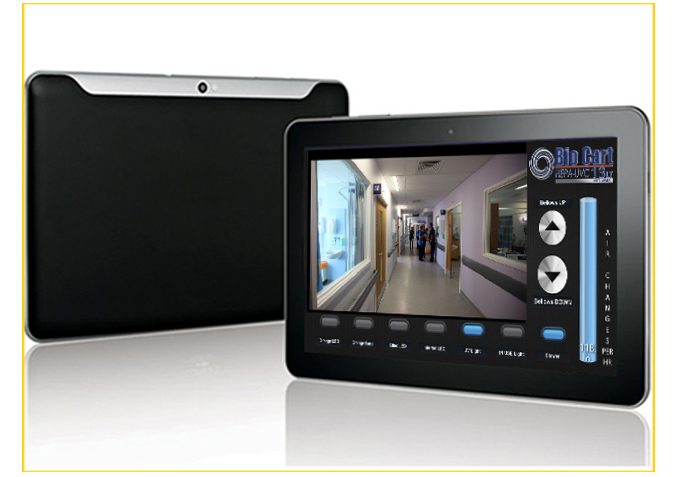 • 10″ Android tablet with Air-Care app included. • Allows for wireless control of Bio Cart 13LT. • Controls On/Off function for Interior & Exterior LED Lighting. • Controls UV light & In Use light. • Also controls Blower, and Bellows Up & Bellows Down. • Allows real-time view of air pressure while Blower is active. 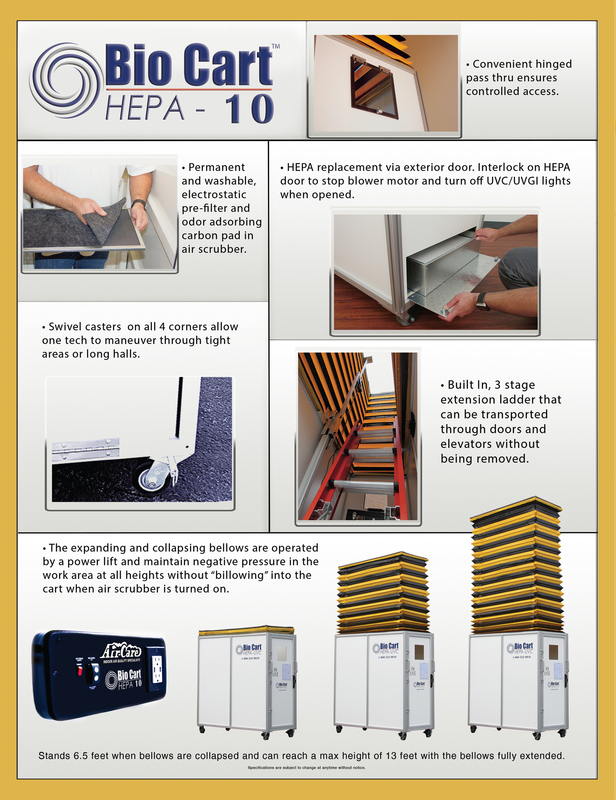 that every HEPA filter is certified unlike others. 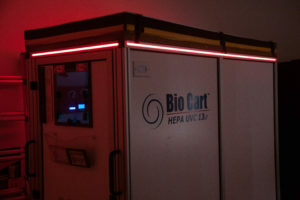 HEPA filtered air exhausts out the bottom of the Bio Cart to prevent air from blowing papers off desks or disturbing curtain around hospital beds. 4 non-marking, 4″ x 2″ wheels: 2 for total lock & swivel caster, and 2 with separate swivel lock and wheel breaks. 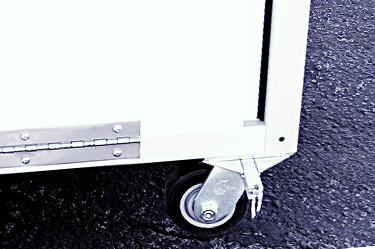 When pushing the cart into a storage position, or a work location against a wall, locking all casters will allow it to be parked precisely in a very small space. The swivel caster wheels allow the ease of maneuverability around even the smallest areas. Total load for all 4 casters is 900 lbs for the Bio Cart 10 & 2,400 for the Bio Cart 13LT. 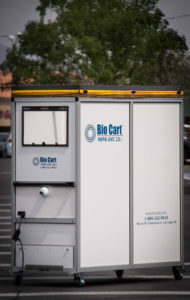 The Bio Cart is the only cart on the market with a power lift. This makes it a breeze to use while maintaining structural integrity. The Electrically powered lift moves the top frame with a foam seal up to the ceiling and holds it in place. No other containment cart has this simple and easy method of mating the cart to the ceiling work area, then lowering it out of the way. The power lift has a 2 stage linear actuator to reach ceilings over 13 feet high while maintaining a smaller footprint than other carts that only reach 10 feet. NEED TO REPLACE WITH CURRENT MANUAL CONTROL PANEL IMAGE OR VIDEO!!! 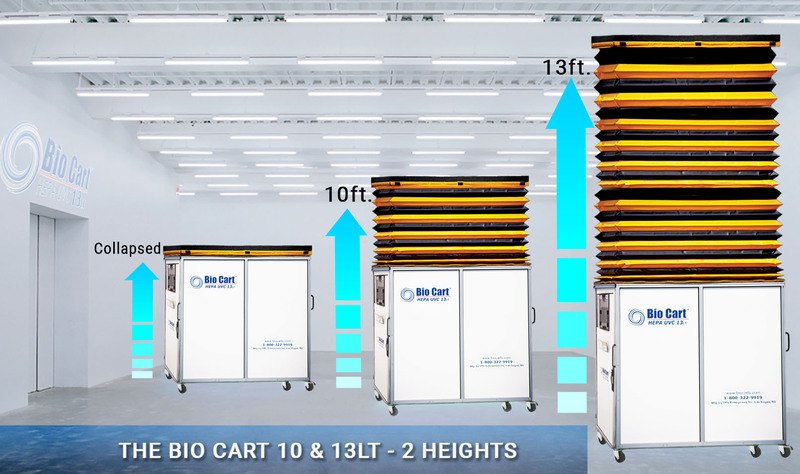 The Bio Cart is the only containment cart on the market that has expanding bellows on the top that are easily raised and lowered using a unique power lift. • The bellows are made of an unique fire retardant vinyl material that is substantial enough to hold positioning, even in low ceiling heights. This is important because it allows the technicians inside of the cart to continue their work without the interference that is typical with the standard containment carts that use a much weaker material. • On the top of the bellows there is a foam seal to help with proper placement on ceilings that may have an irregular surface. • The bellows are operated by a power lift. • The vinyl bellows are easy to wipe clean in place, and include a hook and loop attachment for easy removal. The Bio Cart by Air-Care features a 3 stage, fiberglass, extension ladder to provide electrical protection and meets OSHA standards for electrical work. It is rated Class A for up to 300 lbs. 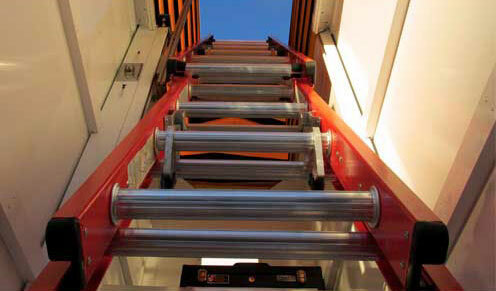 • The ladder easily can be stored at a collapsed height of 6 feet high, and extends up to 15 feet. • The ladder can remain in the cart when it is transported, and is easily removed for other uses. • The ladder fits securely inside of the Bio Cart for ease of transportation. 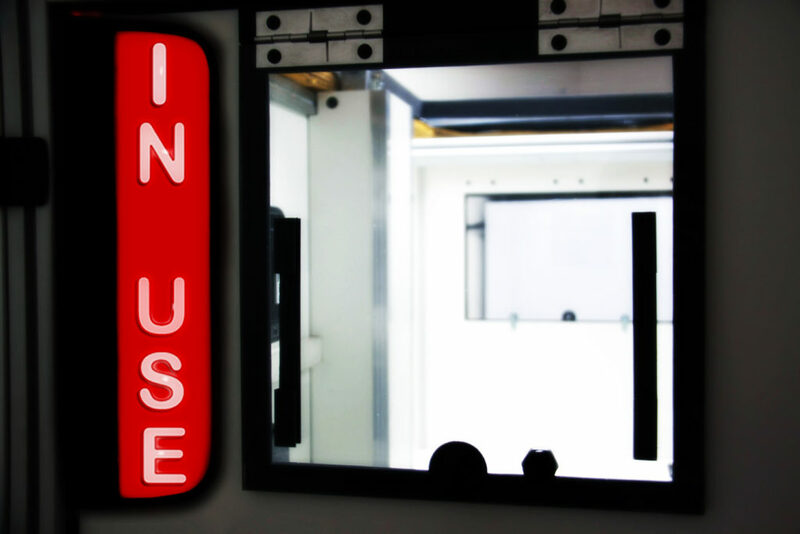 The Bio Cart by Air-Care features an “IN USE SIGN” as another measure to ensure safety during operation. • Notify’s others that the Bio Cart is in operation mode, thus helping to promote safety. • Can be easily turned on and off with tablet. 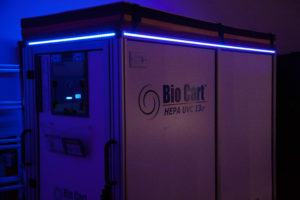 The Bio Cart by Air-Care now has LED Exterior Blue & Amber Lighting available as an added feature. • Amber LED External Lighting. • Blue LED External Lighting. • Blue & Amber External lighting can easily be controlled by the Bio Cart Tablet. • The Front View Camera allows for ease of transport while moving cart from locations. • Get Live View of objects ahead and around the Bio Cart to help make transporting cart easy and convenient. The control panel includes a lift Up/Down switch and air scrubber fan speed controls, interior light switch, and “In Use” sign switch. 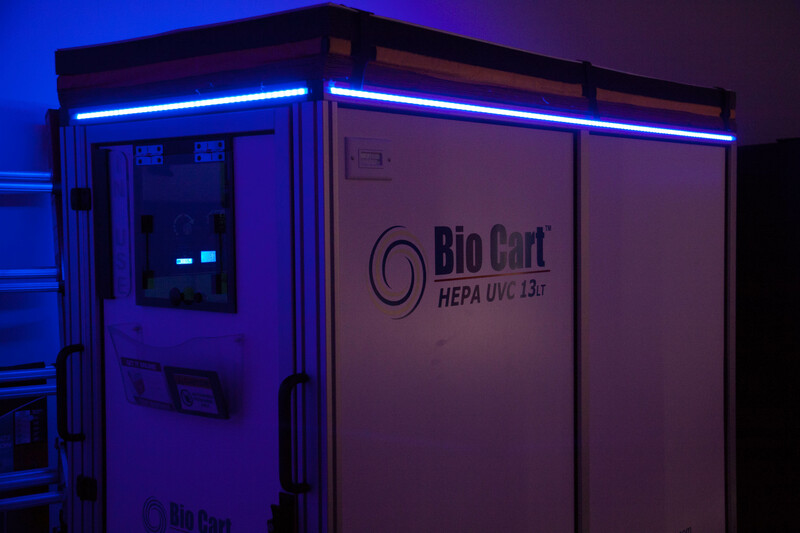 Operate your Bio Cart Manually using the Control Panel located inside of the Bio Cart. 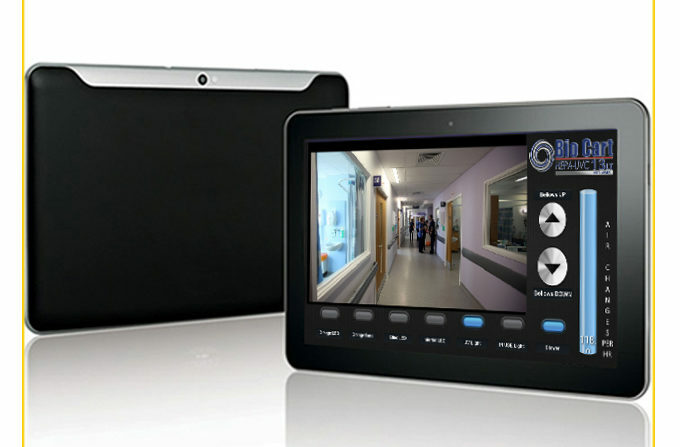 10" Android Tablet w/ Air-Care App. 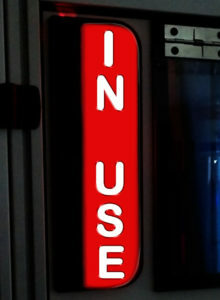 Red LED "IN USE SIGN".